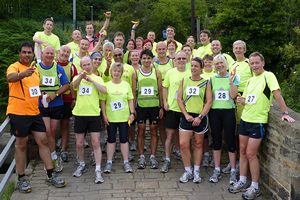 Stadium Runners run from the Stadium Health & Fitness Club every Monday and Thursday evening. We meet at 6.30pm for a quick briefing and warm-up followed by a run. Members of the Stadium Health & Fitness Club can take part in the Monday and Thursday runs free of charge while visitors may 'Pay and Play', currently £2.50 per visit, subject to presentation of the Kirklees Active Leisure 'KALcard' from April 2011. Simply pay at the main Health Club reception and you’ll be shown where we meet. There is no pressure to formally join the club, why not come along and run with us for a few weeks to see if we are the type of running club you are looking for. If so great - join up. If not, no problem! The club has three training groups known as Bronze, Silver and Gold. Selecting the most suitable group enables you to run with those of a similar ability, whilst providing an appropriate challenge. Whichever group you run with no one gets left behind, as those at the front wait at pre-arranged points or run back to join the group. This group typically runs about 5-6.5 miles and is always accompanied by a qualified Run Leader. The group runs at roughly 10-12 minute mile pace, which is equivalent to a 60+ minute 10K time or a constant speed of 8-10km/h on the treadmill. 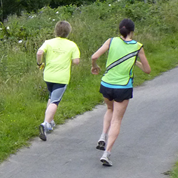 If you are relatively new to running or returning after an absence the Bronze group is a good place to start. The Silver Group runs a bit further and faster than the Bronze. Again the group is always accompanied by a leader but will cover 6-7.5 miles at a pace of roughly 8-10 minutes per mile. This is broadly equivalent to 48-60 minute 10K time or a constant speed of 10-12 km/h on the treadmill. Silver Group runs may also include some more demanding training methods and terrain. Choose Silver if you have been running for some time and need a challenge! If you are already an accomplished and possibly competitive runner, the Gold Group may be the one for you. Gold Group runs will usually cover 8-10 miles usually at 6 to 8 minute mile pace and include plenty of hills. On occasions the run will be led but at other times it will be self-guided, with the group taking responsibility to ensure no one gets left behind.